There are 3 thickness settings available. 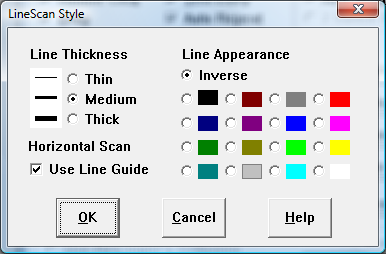 Select the Line Thickness that is easiest to see. If Use Line Guide during Horizontal Scan is On, the LineScan line will remain visible during the FingerScan. If Off, then this line is removed once LineScan is stopped. The appearance of the line used in LineScan may be Inverse (the exact opposite color of what the line is 'over' - for example, the opposite of white is black, the opposite of red is green, etc. ), Black (solid), White (solid), or any of the standard colors available on a 16 color display (Dark & Light Gray, Red, Green, Blue, etc.). You should try each of them to decide which you prefer.